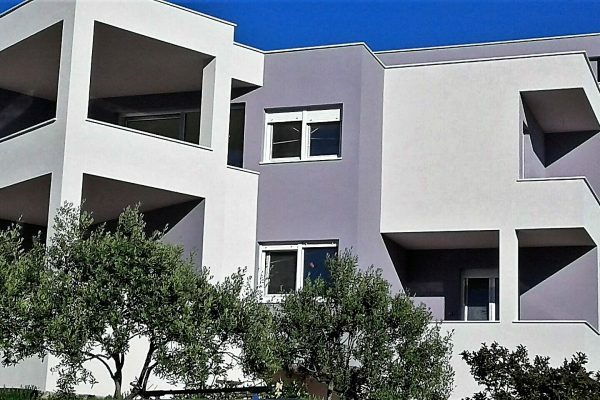 RG1387AP – Two luxuriously designed villas for sale Rogoznica, one seafront and the other second row to the sea, at the beginning of the building process, set in a quiet area and at the same time close to all amenities. Due to a slight slope this terrain offers memorable views of the pool, the sea and the wonderful green surroundings. The total surface of the seafront villa – villa A – is 162m2 and it is split in two levels, with the additional lower ground level which consists of a garage. The living space (in total 153m2 without balconies) consists of the ground floor and the first floor. The ground floor comprises of one bedroom with an en-suite bathroom, a toilet, and living area with kitchen and dining area which opens to a large semi-covered terrace with amazing vistas of the sea and the bay. On this level there is also a lovely pool area with a swimming pool. On the first floor there are four bedrooms and two bathrooms of which one is en-suite to a bedroom. On this level, two bedrooms and a corridor exit to a balcony. The second row villa – Villa B – is 226m2 in size and it spreads over three floors. The first level consists of two bedrooms, one bathroom and a living space which opens to a semi-covered outside space. The second level comprises of a toilet and a large living area together with the kitchen and dining area. On this floor there is also a garage that can be approached both from inside and outside. This floor opens to the outside area too. There is a covered area for the lounge space and it spreads to the swimming pool. On the top level there are three bedrooms and two bathrooms one of which is an en-suite to the master bedroom. This property offers startling sea views. 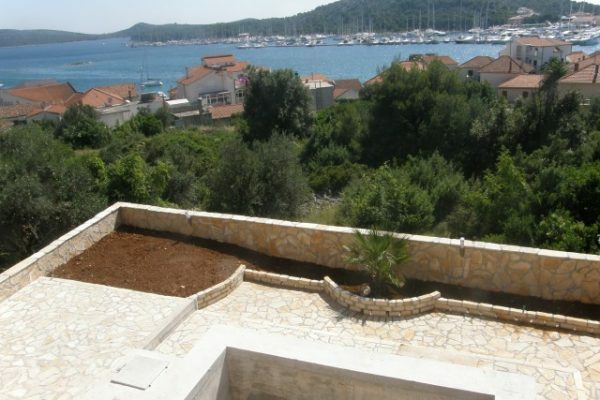 These villas for sale Rogoznica are an excellent example of how great natural environment and modern technology go together. The future owners of either of these two villas will bask in the feeling of serenity that such a marvellous setting incites. However calm and serene the micro location is, all the amenities (restaurants, a couple of cafés, a shop, etc.) are just a pleasant walking distance away. Since this area is very close to the edge of the building zone, one can explore several quiet and secluded small beaches in the area or visit a beautiful pebble beach close by. Right in front of the villas there are nice areas to have a swim. The bay where the villa is located is in the very heart of Dalmatia, in Rogoznica area, only 10km from the Frapa Marina, some 40km from the Adriatic Motorway, and there is only 30km to the international airport in Split. Although this area is getting more and more popular among tourists it is still not too crowded, the nature is well preserved and the sea is still clear and mesmerizing. Thanks to all this there is a growing number of tourists who want to create themselves a second home precisely in this area.